When I first went to the original Modrý zub Noodle Bar on Jindřišská near Wenceslas Square, I didn't think their Thai cooking was very good. Over time, it got better and better. 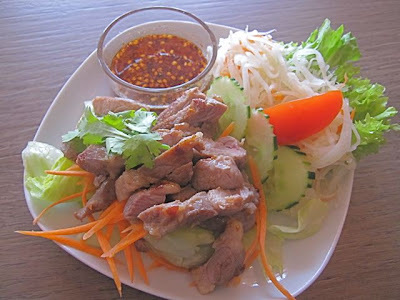 Now, I consider it my second favorite Thai spot after Noi. 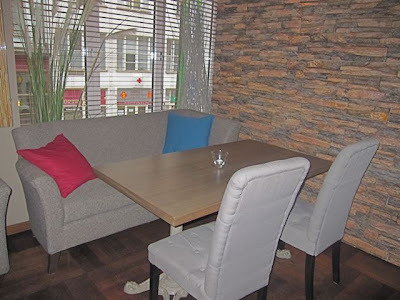 When I heard a new, larger Modrý zub Restaurant opened on Spálená, near TESCO on Národní třída, I was quite pleased. The nearby stop for tram 22 is one I spend a lot of time at. 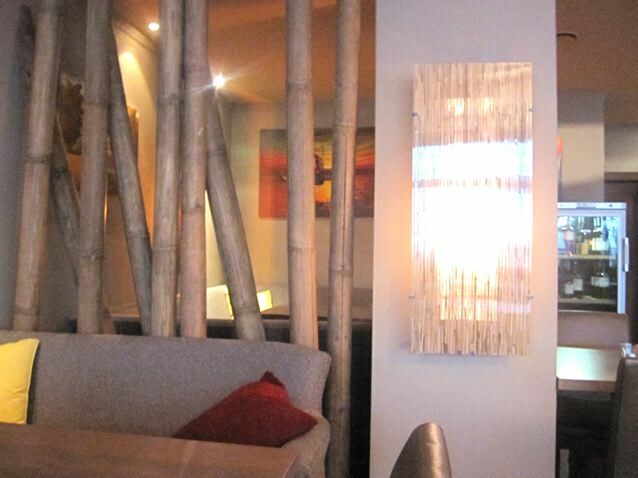 However, the restaurant location, just up the road from the stop, was not auspicious for its previous tenants. 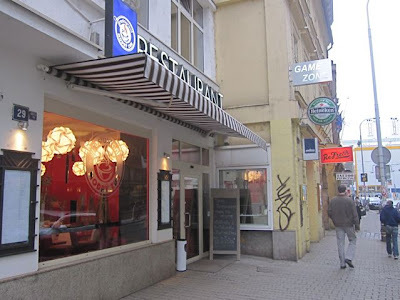 As Claire Compton noted in her concise review of Modrý zub Restaurant in The Prague Post, Gott Gallery Restaurant and City Café Cosmopolit couldn't make it work there. As I walked up to the restaurant, I could see part of the problem. That area is almost out of sight of the tram stop, it is surrounded by derelict, shuttered stores, and it doesn't get much foot traffic. What a difference 100 meters can make. 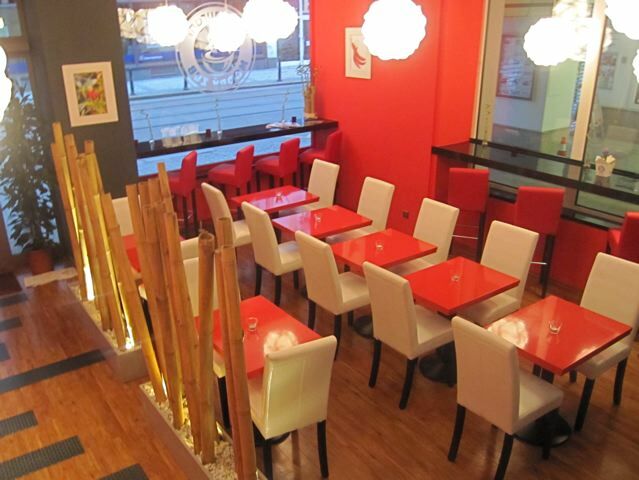 The bright red chairs and walls on the lower level certainly do catch the eye. But I did not find it very inviting, especially because the manager and some of the staff were lounging in the otherwise empty space. Also, the tables are way too close together. So I went upstairs to the much more attractive dining room. The hardwood floors, couches, and comfortable chairs were much more welcoming. But I found the abundance of gray in the room rather unfortunate. I started off with homemade, fresh ginger and mint lemonade (65 CZK). I liked it very much. It was tart, and not too sweet. There were bits of fresh ginger floating in there, giving it a pleasant sharpness. 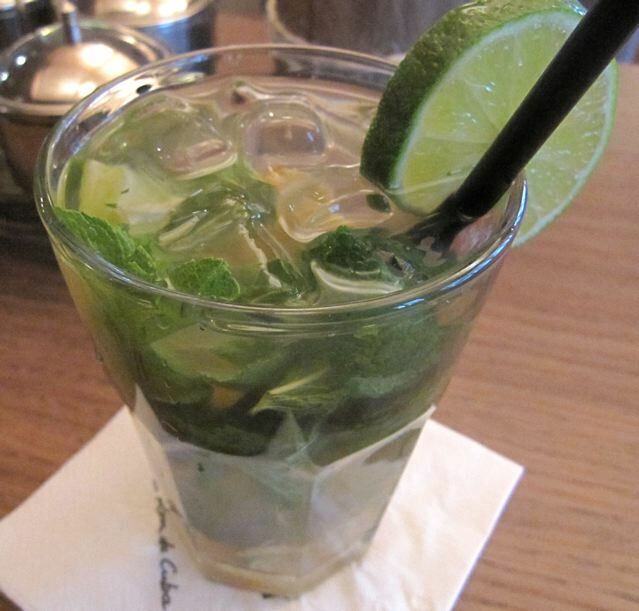 The drink also had plenty of mint leaves. Calling it lemonade, though, is a misnomer. It was made with lime. In fact, it tasted very much like a ginger mojito, which is also listed on the menu (120 CZK). I decided to have a bowl of my favorite soup, Tom Kha Kai (85 CZK). I thought it was excellent. The soup was quite spicy and had just the right amount of sweetness for my taste. I could taste the galangal, plenty of cilantro (coriander), and fish sauce. There were also some tomato chunks in there with decent shredded chicken. For my main course, I had the dish I give a lot of weight to in judging a Thai restaurant. And that is the Phad Thai. I got it with chicken (185 CZK), but it is also available with shrimp (295 CZK) or tofu (165 CZK). My verdict? Not good. 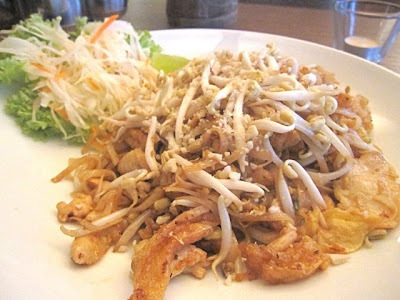 I found this Phad Thai to be bland and boring. There were occasional bursts of salty-sweet flavor from the fried tofu, but the noodles were just lightly salty. The earthy flavor of the sprouts stood far above them. The peanut and egg disappeared into the background. The chicken was overcooked and tough. Fortunately, the waitress had put a dish of condiments on the table. I added fish sauce to increase the savory factor, and yes, I also mixed in some sugar. I should have asked for fresh lime, as well, but I didn't think of it at the time. I doctored it up to the point that it was reasonably acceptable. But I was still not happy with it. 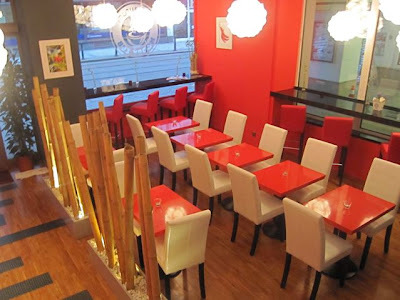 I've had way better versions at the Modrý zub Noodle Bar and at Noi. The bill for this trip was 335 CZK. But since I was flying solo, I knew I had to return again. I showed up at noon on a Saturday, and made my way straight up the stairs. I was rather surprised to find the staff mopping the floors at this time of day. They told me I could eat downstairs or come back later. I walked around for 15 minutes, returned, and the floors were still wet, but they told me I could have a seat anyway. 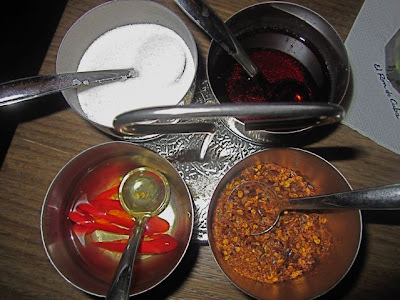 This time, I ordered the Mu Yang or grilled pork neck served with "dried chilli sauce" (145 CZK). The tender chunks of warm pork were lightly marinated. They weren't dry, but not exactly juicy, either. The sauce was quite basic -- a sweet, vinegary base, filled with dry chili flakes that gave it some serious heat. The whole thing was simple, but I liked it. However, I also thought the price was way out of line. There was a paltry amount of pork on the puny plate. For that money, there should have been much more. Service was really dragging on the second visit. Maybe they were still mopping up in the kitchen. My starter took 25 minutes to arrive after my order. Also, I found the weird electronica music they played rather annoying. My main course came 45 minutes after my arrival. That's far too long, considering I was the only one in the restaurant. My main course was the Panang Curry with Beef (210 CZK). It is served in a big, clay hotpot, and white rice is included on the side. I spooned the curry over the rice and saw that it was very watery. The sauce did not sit on top of the rice. It mostly drained to the bottom of the plate. 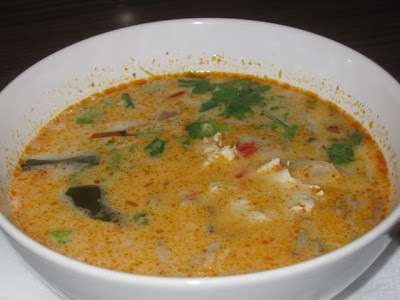 It looked remarkably like the Tom Kha Gai soup, and tasted similar. The main difference was the abundance of lime leave slivers, which I love. They dominated the flavor. 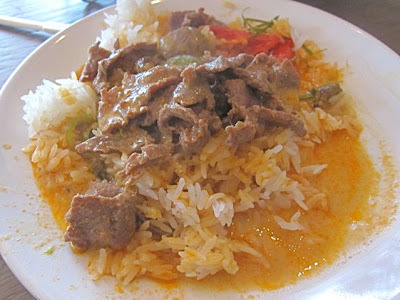 The beef was on the tough and chewy side, but that seems to be the standard for almost any Thai beef dish in Prague. If they had added some coconut cream to thicken up the sauce, I'd have raved about this dish. I still liked the flavor, but it could have been so much better. The cost of this visit was 420 CZK. Overall, I found the food to be very average, with the exception of the Phad Thai, which was substandard. I didn't feel either meal was a great value. But I had similar negative views about the Modrý zub Noodle bar when it opened. And then it got better. So if I return, I'm hoping for some better déjà vu. "As I walked up to the restaurant, I could see part of the problem...." And the Heineken sign won't attract many people, either. Why? 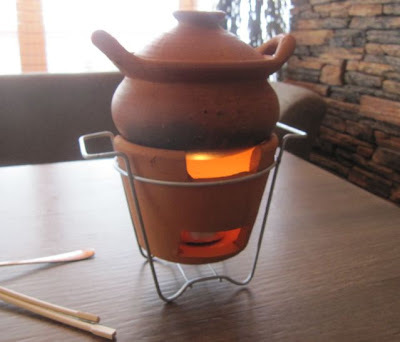 Why do restaurant owners fall prey of those pseudo-imported brands? 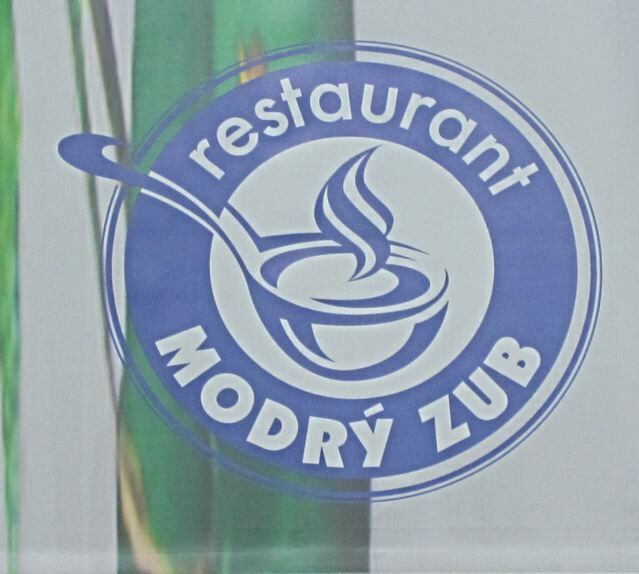 Modry Zub should charge about 125-150 CZK for its food. It's overpriced, and the quality is very unpredictable. It'll probably go out of business. The first Modry Zub is also unpredictable. Sometimes good. Sometimes awful - but always overpriced. 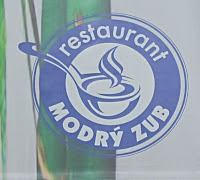 The food at Modry Zub is more expensive than New York, go figure. This is spot on! I visited there recently with my family after noticing that it had opened up. I agree with everything you say about it. I would add that the service there was terrible. 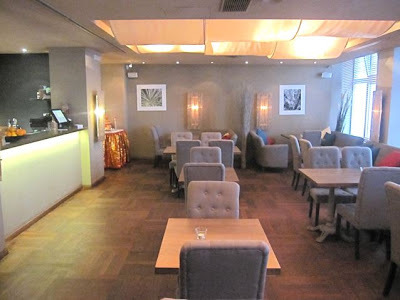 Everything took a long time (there were only 3 tables busy at 7pm upstairs) and the waiters would just disappear for long periods so top up on drinks were impossible. When they did appear they just looked bored an uninterested. I would say food is OK but way too expensive for what it is and comparing to Noi.